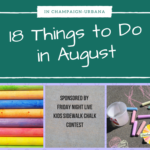 Check out our top picks for a great time for your family throughout August, sponsored by the Friday Night Live Kids Sidewalk Chalk Contest. Fall is in the air this weekend in East Central Illinois, which means we have another weekend PACKED with fun! Thanks to Krannert Center for the Performing Arts. Check out our top picks for a great time for your family throughout August, sponsored by Friday Night Live. 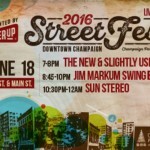 StreetFest, Strawberry Jam, Sprouts at the Market, Juneteenth celebrations and Father’s Day festivities … it’s another boredom-free weekend in Champaign-Urbana!